The (Dicentra spectabilis 'bleeding heart') is a perennial plant native to Japan. The plant is noted for showy flowers of red, pink and sometimes white in color. The flowers hang down from arching stems that grow to 2 feet. The flower hangs like a drop from the red petals and its shape suggests the bleeding heart image. Gardeners often tell stories and legends about this plant's meaning. Most center on a tender or bleeding heart. Gardeners will hold up a bloom and tell a story as they peel away parts of the flower. The removal of the red petals shows the presentation of pink bunnies to a princess by a prince who is courting her. She is unimpressed, so he removes two white petals as flashy jewelry. She is still unimpressed. Removing more of the flower, he reveals a heart-shaped center with a line. The line is the dagger with which he stabs himself in his despair. The princess declares that her heart shall bleed forever. In this story, the pink petals represent Cinderella's ball gown. The white petals are her plain bloomers. Once these are removed, the two parts showing are the glass slippers. The remaining heart breaks into three parts representing the fairy godmother's wand, gold dust and Cinderella's crown. Some storytellers point to the remaining seed pod and say it is the champagne bottle for the wedding. The white bleeding heart plant is also called the Dutchman's breeches, or trousers. The white flowers contain alkaloids that may be poisonous, especially in large amounts. The plant has also been likened to a Lyre and to Venus's car. 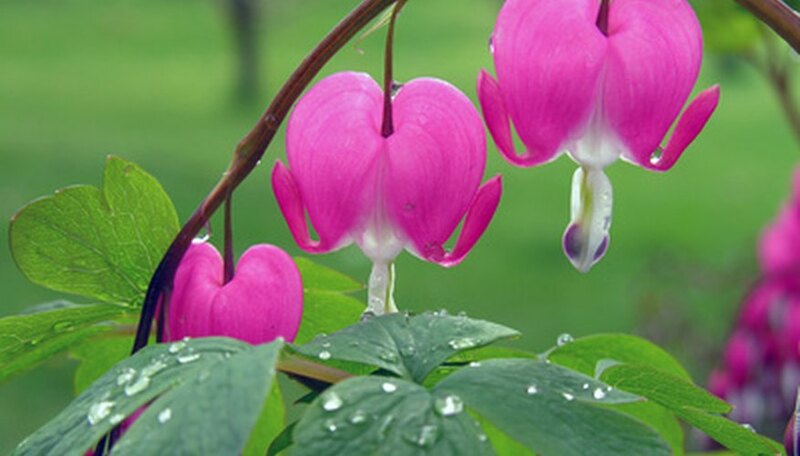 The bleeding heart plant has been grown for centuries in China and Korea as well as in Japan. In 1740, a German botanist, J. G. Gmelin, first brought a living plant to Russia for a botanical garden where he worked. The Royal Horticulture Society brought the plant to Western Europe through the work of Robert Fortune in 1847. The plant traveled to America as a gift for Valentine's Day because of the heart shape of the blossoms. While the preference of bleeding heart plants for the garden waned in Europe, it became a popular garden perennial here.